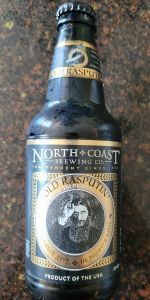 Old Rasputin | North Coast Brewing Co. Pours a shade of black, barely dark brown around the very top and edges of the beer - looks super viscous and thick as hell. Leather-tan head, super thick with little fine bubbles; great definition and nice retention. The chocolate aroma is noticeable even before putting your nose to the glass. Huge bouts of unsweetened, dark cocoa beans and bittersweet, black coffee/espresso beans as a secondary note. Big-time roasted malt aromas fill your head, leaving a silky smooth and buttery feeling before even taking a sip. First sip, chocolate amasses on the palate to a huge degree; dense and deep - not like a milk chocolate bar, more like a less-sweet version of dark chocolate, raw cocoa beans, dry cocoa powder. The chocolate gives way fairly quickly to a charred, woody, nutty flavor; oak and nuts, just toasted to hell and burnt to a crisp. Some slightly bitter coffee is in the background, maybe more like espresso - very strong, deep, rich, and dense. The woody flavor lasts until the end and even begins to take on a smokey character after a bit. A few seconds before the final moments of the sip, the bitterness of the hops start to come alive, and are very noticeable here, unlike many RIS's where the hops are almost nowhere to be seen. They take on a very herbal, leafy, and grassy profile, playing hand-in-hand with the bitterness from the unsweetened cocoa and coffee flavors earlier. The bitterness from the hops grows and fades out - the aftertaste is a combination of the herbal burn, charred and smokey wood, slight tobacco, and an overall roasted-character finish. Overall, a very dry, bitter, and nearly harsh finish which is supported by some underlying sweetness from the malt. Alcohol warmth is notable at seemingly random times, but never impedes or distracts. Thick and creamy body, silky smooth, robust, and rich. Medium carbonation, slightly higher than many other RIS's. Wow, a truly complex beer, and very true to it's style. This RIS is unique enough to stand out and that's what has allowed it to make a name for itself. Nice, noticeable bitterness and herbal hop presence which goes unnoticed in so many brews of this style - very refreshing for a change of pace. Slow sipper at 9.0% ABV, but the alcohol plays well with the palate and never gets overbearing. Bottom line: if you like RIS's - stock up on this. A freakin' evil looking 12 oz. bottle with a sketching of Rasputin and some Russian words (probably a hex on all who partake of the stout within). Black as night, with a brown chunky head that seems to crawl, rather than stick, to the pint glass. A very impressive cascading effect when poured. Highly roasted malt aromas and alcoholic to the nose. Smooth, potent and espresso like with a high burnt malt and hop bitterness that finishes on the sweet side to say the least. Very complex, and true to its style. Well worth the $3.00 (+/-) paid for the single bottle, and I'd definitely buy it again. Not a beer for the faint of heart, but rather barley wine lovers and chocolate fanatics. Everything about the drinking experience was amazing. As soon as I finished it I grew a beard and invaded Ukraine. The thickness was delectable. In fact, I even consumed it with a fork. Would probably pick this over Kirkland Light any day of the week. One hell of a cult classic, certainly a kick back and relax beer. I love when winter comes so I can enjoy these beers ot their fullest. Holy coffee-chocolate-licorice-flavor mother of god -- this one is big indeed. Nice deep black color. Medium head. (Hint of cat pee aroma not so great but easy enough to look past). 1st one and certainly not my last. i was going to try and float a pils on top but that would just f-it up. Like a good Guinness on steroids. Taste: starts creamy dark chocolate and heavy roasted barley, then fades to coffee bitterness and finishes dry. there is a ton of good flavors going on in each sip. however they are all perfectly balanced and there is no hint of an off-note. Overall: i have been drinking this beer for over 15 years and i have always loved it. it is actually the beer that converted me from Coors to the the craft brew club! i have drank this from bottles and on tap and either way it is an amazing beer. i just decided it is truly perfect! if i could only drink one beer for the rest of my life this is it. Look: Pours a proper admixture of angelic suicide and blood; the black, inscrutable dent revealed when a boulder on the fiend's frozen lake is dug out of its ditch; the swatch of some god-primeval's mourning cloak; oil powering the cavalcade galloping towards Revelation. Smell: The reek is of confusion, phobia, and midnight blitzkrieg. Chocolate factories incinerated to charcoal; scorched earth at its most evil and intense; memories of milk on the lips of a dying man; flickers of knife sweat as it quick-slits the cord linking body and soul; bread immolating itself to save the bakery; wood chips reaching into the furious atmosphere discombobulated; branches bled of all resin embracingthe air snapping; succubus licked tootsie roll pushed with unrelenting, though magically gentle, force deep into my mouth; sooty licorice and a chunk of boot from the first Hun gunned down discovered in grandfather's box of curios from the Great War; an undecayed grape dropping out of an emperor's tomb. Feel: A sense of my breath being held hostage in a closet between fire and some oblivion hole. Was stunned to realize I hadn't reviewed this one, having had it several times before in my life. Very dark brown, pours decent sized tan head, creamy and lingering. Chocolate, raisin, coffee aromas dominate for me initially. A rich, sweet roasty aroma. Quite malty sweet up front, with some of the chocolate and dark fruit noted in the aroma. Roast and bitterness is present early, but stays somewhat muted compared to some imperial stouts. Finishes with the roast taking over, but the malt sweetness never completely ceases. A delicious stout without being overpoweringly stouty. Full body and moderate carbonation. No astringency, and a mellow warming. Might prefer a lower carbonation level. Always a favorite imperial stout of mine due to its drinkability. Some RIS examples are over the top in terms of alcohol and roast. This one is not. A deep shade of black with a black hue. 2 finger head coming out of a 12-ounce bottle with a slightly aggressive pour. No light what-so-ever getting through this one. The foam is a nice deep tan/khaki color. Great head retention. Bubble replenishment is great. Very rich coffee, hops, and chocolate. There is a fair amount of sweet syrup that wafts up as well. There is a slight smoky smell along with a bit of caramel. A good deal of hop bitterness cuts through right up front. Then it kicks into sweet caramel, coffee, toffee, chocolate, and hops (rich and savory, not bitter). There is a nice roasted/smoky flavor in there. The sweetness starts to fade out, and some hop bitterness seems to come back as it dries out. I was left with a very nice aftertaste when the flavors die out. Tastes of smoked grains, caramel syrup, and hops linger on. Very rich, thick, and full bodied. Never goes flat and a bit oily. This is an amazing beer. I have seen this beer in the top beers list for a while. I can see why. This beer is very good with many complex flavors. There are sweet flavors, bitter flavors, slightly fruity, hoppy, and smoky. This tastes like a mixture of a few beers: Black IPA, Brown Porter, Chocolate Stout, Coffee Stout, and a Milk Stout. Very impressive. I bought this in a 4 – pack (as I normally only purchase singles of beers) and will definitely polish off the pack and purchase more in the future. This just may become one of my favorites. First taste was poured from draft (nitro) a couple weeks ago, and while it was very good I just don't prefer the flat feeling of a nitro beer so I held off on rating until I could try the original version. I enjoy the feel of carbonation. I later found it again, regular draft, and it was absolutely delicious. I would go so far as to say it's of the best year-round Russian Imperial Stouts I've had to date. A must try if you have not already. This is THE staple of Russian Imperial Stouts that paved the way for unreal American stout brewers of this depth, boldness, and aggression. The beer pours with a deep onyx black color, a 1" froathy tan head that rises to the top of the tulip and proves to be steadfast til the end. A fair amount of lacing, soft legging, and retention. Strong aromas of roasted malts, burnt toast, deeply roasted coffee, and waves of burnt cocoa. Truely aggressive, attacking the nose. Equally strong flavors favor the espresso character, while the burnt toast and cocoa provide complex flavor to the highly roasted grains. Milder fruity flavors of plumbs, dates, licorcie, and raisons round out the roughter grain-related tastes very well. Not to be outdone, the hops also provide a piney, light resin tone to the finsihing flavors. Lightly acidic flavors later remind me of bitter coffee once more. Sweet, smooth, creamy textures conjure up a full and round body with a billowing and expansive initial mouthfeel. The beer settles and allows the hops, acid, and light sourness to cause a lightening in the body to allow for ease in drinking. Hop bitterness begins to gain dominance over the astringent coffee, toasty bite. The light warmth of 9% abv. kinda gets lost in the complex flavors and textures. Very well attenuated and controlled yeast character made this beer a Godfather of Stouts and continues to outlast newer Stouts with its restraint and boldness. Always a pleasure to see this beer in my glass. Pours pitch black with a frothy milk coffee head. Great distribution and retention. Aroma is of coffee, chocolate, steely grain, and a whiff of earth and grassy hops. Lots of dark chocolate up front with dark roasted coffee and a lingering steely bitter finish. Mouthfeel somehow at the same times feels rich and viscous, but also crisp and refreshing. A very tasty beer, although the metallic aroma and flavor is a bit off-putting. Had on tap, a great winter beer. I haven't really been too big into stouts but lately more so and this one is truly fantastic. Totally black color with a nice minimal carbonation and super frothy creamy head, only about a centimeter thick. Lace clings to the glass like mud. Smells very toasty and roast from the malt. Clean and alcoholic at the same time with some spiciness. Taste is very smooth and rich almost sweeter toward the beginning but that fades away quickly with the roasted/burt malt and coffee characteristic of the middle. The finish is hoppy and still coffee like with a little milk chocolate and slightly sweet. Super creamy mouthfeel, very light carbonation. Very worth it to pick some of this up again. I poured this into a pint glass. The appearance was a jet black color with a thin half finger of off white to slight tan foamy head. There was a gentle spider web lacing sticking but ending up sliding a bit into the beer. The smell had some nice roasty to sweet chocolates with a decent amount of light roasty coffee. The taste was mainly sweet with a nice roasty chocolate quality to it. There is also a nice long dry chocolate aftertaste with a very satisfying sweet finish. The mouthfeel seems to be fairly creamy and sweet. Overall, so glad to have this again tonight for a nice touch of a revisit and that I have three more of these to cherish. I read several of the reviews on this beer. Ive had other imperial stouts and was excited to try this one. I couldn't be more disappointed. The feel and look are fine for an Imperial Ale, but my overall score is based on the taste, which is the most important factor. It's way over-hopped so it drowns out any subtle flavors from the malts. Stouts, in my opinion should be malty to balanced, with the bitterness coming from the roasting of the malts rather than an over abundance of hops. It's as if they're trying to turn it into the dark version of an IPA, an IDA? IPAs are fine if that's what you go for, but when I drink stout ale I want to enjoy balanced malty goodness, not Christmas tree flavored brew. This is just a terrible ale. Brewers shouldn't feel they need to add a ridiculous amount of hops just because the alcohol content is high. This ale would probably be pretty tasty if they dialed the hops back a bit. I didn't give it a 1 because I would reserve that for Coors and Budweiser. This one poured a deep brown, nearly black, with a thick sudsy tan head that left excellent lacing down the glass. This was poured from a cold bottle into your run of the mill dinner glass; nothing special. A moderately vigoroua pour is needed with this one, go to hard, and you'll easily overflow your glass. The first wiff out of the freshly opened bottle comes across sweet and chocolaty, which, to be honest, is what I was expecting. The arouma only grows stronger as the brew is poured. "Wow", my literal response to the first sip. Sweet chocolaty flavours erupt upon the palate, giving way to coffee and char. Only after swallowing do the hoppy, bitter flavours that I personally prefer in a breq emerge. It may take a few sips for the true cacao flavours of this one to emerge. I may have to bring this one back to WV with me. It poured pitch black with a thick one inch foamy head that didn’t want to die untl the last drop was gone from the glass. The lacing is thick and clingy. The smell is roasted malt with coffee mixed really well. The taste is bitter but very sweet having the hops combine nicely with the roasted malt and coffee. The beer gets sweeter as it goes. There is an ever so slight caramel in the taste as well. The palate is medium to thick bodied. Overall, this beer never ceases to amaze me no matter how many times I have it. Color is dark, dark coffee with a nice, big, creamy, beige head that cascades bubbles as you pour and laces like a boss when it's done. Aroma is chocolate, a hint of raisins, coffee, and booze. Taste follows, but the bitter roasted coffee is more forward and the sweetness is less pronounced, although it balances nicely. Lots of alcohol burn but not unpleasant, I think it's what makes this such a good wintertime sipper. Mouthfeel is somehow thin and creamy all at the same time, with lots of carbonation and tongue numbing warmth making it a very fun drink. I wouldn't want this every day, but sipping this thing as I watch the snow coming down feels just about perfect. Just finished my second 12 oz bottle of this and DAMN is that good. Most of my experience with beer has been with Belgian strong Ales, in particular all of the Trappist beers along with similar Belgian brands and American beers in the Belgian style. My two favorite beers are Rochefort 10 and St Bernardus 12. In recent years I've been trying different Stouts and Porters and, although I don't have tremendous experience with them yet, I'm quickly discovering the world of flavors out there that go beyond the various dark fruits and assorted sugars that accompany your typical Dubbles, Triples and Quadruples. A fellow shopper at the market recommended Old Rasputin Imperial Stout to me and I've been blown away by how something so roasted and bitter can at the same time be sweet and smooth. From the get go this beer is thick, viscous, and oily, not that that's to it's detriment. In fact the wonderful chewiness just hooks you into discovering the many wonderful facets of the beer. Immediately you taste the full intensity of the coffee, toffee, roasted malts and baker's chocolate it has. There's a burnt quality to the malt that, along with providing a pleasant bitterness, also includes the required sweetness that is reminiscent of a burnt s'mores marshmallow rather than anything unpleasant. Then there's the coffee flavor. I tend to drink really dark, black coffee and this beer has loads of that toasty, smokey and bitter flavor that I cherish. Finally there's the great Christmas toffee and dark chocolate flavors that blend seamlessly with the sweetness and bitterness of the other flavors and tie everything together nicely. Also quite remarkable it this beer's head, which is truly like a silky pillow. I can easily say that the foam tasted and felt in my mouth like a liquid marshmallow. I've never had a beer whose head was that silky, smooth, and sweet. I couldn't believe it was beer foam. In the short amount of time I've been exploring Imperial Stouts I can easily say that this the best I've come across so far. I'm happy to give it my highest recommendation. Poured from 12oz bottle into glass. Possible date stamp on label is '81330709'. This is a 2018 produced beer. Black colored body, with some dark brown and ruby brown edges when back lit. Aggressive pour brought forth a one finger, puffy, khaki colored head. Each sip leaves behind a few scattered spots of lacing. Well balanced aroma of dark roasted malts with char, coffee, and chocolate. Out of the char is a whiff of dark dried fruits. Taste is dark roasted malts that express deep dark chocolate, burnt coffee, and a hint of soaked, dark dried fruit. Quite the smooth and creamy mouth feel. Very enjoyable. Okay carbonation. Not overly bitter. Tremendous balance of the flavors lead to a very pleasant drinking experience. Very easy to take repeated sips in short order. Bitterness is kept very low and the char stays at the end, but the slight sweetness of the malts balance this out. There is a companion component of brighter hops that add well to the mix and balance. Appearance: One of the best looking stouts I have ever seen. A pitch black beer that pours a huge, three finger khaki colored head that laces the glass exceptionally well. Head retention is superb, and lasts for a good 10 minutes before finally settling down. Aroma: Lots of dark chocolate and roasted malt with hints of coffee and sweet vanilla. A tiny hint of piney hops and notions of fine tobacco. A little bit of alcohol on the nose as well. A great smelling stout. Taste: Extremely pleasant. The flavor is predominantly consistent of a creamy, dry, dark roasted malt flavor. I'm getting bittersweet gourmet dark chocolate, rich connecticut tobacco, old leather, hints of vanilla beans, coffee and very very faint notions of sugar cookies. As it warms resinous, piney sensations from the hops assert themselves. Feel: Full bodied with low carbonation. Smooth and velvety. Crisp (for an RIS). Overall: Probably my favorite russian imperial of all time. Very hearty and complex, with deep notes of bittersweet chocolate and roasted malt. The mouthfeel and taste are really perfect for the style. The flavor is intricate, robust and creamy without the mouthfeel being too unctuous or slimy. Just dry enough so as to not leave you reaching for a glass of water, and crisp enough to enjoy during the warmer months without being too watery and thin. This beer isn't for everyone but if you have a palate for dark chocolate and imperial stouts this is one you'll really enjoy. Old Rasputin from North Coast Brewing Co.